After a guiding career that dates back well over fifteen years I now find myself working somewhat a swing shift. Like many other occupations guiding for muskies successfully means working long unusual hours. During the past few years while guiding summers in the northern muskie range I find myself regularly spending a lot of my on the water time by the light of the moon and stars. Over the last four summers in the Northwoods three of them have been extremely .hot early and proceeded to just get hotter. These high air and water temps equal night fishing in the northern muskie world to drastically increase your odds at big muskies. I’ve always night fished some but over the last four years my clients and I have spent well over 300 nights on the water. Consequently I have learned that not only is night fishing an awesome alternative when things heat up but muskies night feeding patterns are not just based on temperature alone. They will feed after dark even as the water temperatures drop well into fall. Night fishing is certainly not new to the seasoned muskie angler but as our weather patterns are changing with hotter days and rising water temps the productive northern muskie angler now needs to change their approach to after sundown to drastically increase trophy potential. Also it has become a great way to avoid pressure from other anglers; it can get lonely out there after the sun goes down on many bodies of water but the rewards can be catastrophic. In fact my percentage of big muskies after dark by far out number those taken during daylight hours in northern Wisconsin and Minnesota from late June to late September even though the amount of fishing hours are nearly the same or maybe a little less at night. But the most important fact is that night fishing produces bigger size fish; rarely do you contact the numbers of smaller fish at night as those you do during daylight fishing. Also the trophy ratio is much higher; working The Night Shift is flat out an awesome approach to consistently catching big muskies and with a few simple adjustments from your daytime habits you too will have much better results at the end of your musky season, Here’s How. First off a point I want to stress is that night fishing is a commitment needed to be approached as you would have while daytime fishing with as much time invested. Once the water temperatures start rising toward there peaks nighttime efforts start to out produce that of the daytime hours. Many anglers refer to night fishing as those few hours after the sun goes down but in most cases I’ve found that the light transition periods are not the night’s prime times. In fact most of the bigger muskies my clients and I have contacted come at least 2 to 3 hours or more after the sun falls below the horizon. By no means am I trying to say that’s a bad time to be on the water just that it cannot be the only hours you spend after dark to determine if conditions are going to be at their highest. My night shift generally starts a couple of hours before sundown. My clients then have a shot at what just might be one of the best times on the water sunset. Then Ilook at the hours of moon set and moon rise to determine the length of our outing. Maybe more important I let the fish tell me when the right times for us to be on the water. I have found at night somewhat like that during the day multiple fish opportunities can come around the same times night after night for an unfortunately short period. Most nights I have at least 2 if not three anglers casting baits; this gives me a great advantage when it comes to lure selection. Through trial and error, combined with the input from friends and fellow guides my conclusion proves that some lures just out produce others under different light conditions. Blade baits have been the best night producing lures over the last few years for not only me and my clients but most all of my colleagues, those with large multiple blades prove to be even more productive. I credit much of my clients success to blade selection, blade color is a very crucial part of my lure choices while night fishing under all phases of the moon. I’ve found that blade color is more important than lure body color. My preferences are different under both bright and dark conditions. Under low light conditions I prefer blades in nickel, gold, or brass. Brighter nights call for brighter blades pink, chartreuse, red and orange. 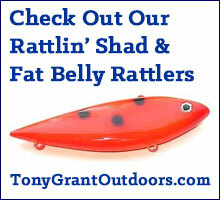 If I’m sounding partial to bucktails I am, however a successful night arsenal must include several other lures. Large bladed spinnerbaits, Depthraiders, Heli-dawgs and surface baits all have their time and place and will account for many big muskies during your nighttime approach. Later I will cover some of situations that they will consistently out produce bucktails. Let’s discuss where we start under the darkness when the sun goes down. Locations at night are significant, areas that my clients and I find fish are similar to those during daylight hours but many times with a little variation in our boat position we work many of them just a little different. During these hot times in the Northwoods we start our day in the early morning in shallow water and move further and further out as the sun gets higher. But at night I go back to the same shallow structure spots, in most situations shallower is better when fishing after dark although there are certain light conditions that I pull out just a little farther which I will explain further. Lakes that offer mid lake humps or sunken islands generally go overlooked. All fish are not found near shallow cover, I have found that these open water structures don’t have to top out to close the surface. Those that top out 10 to 15 feet below the waters surface can produce some of the bigger fish. The moons different stages are a much talked about and debated scenario among not only day time anglers but especially those whom chase these fish after dark. I have listened to many different opinions and explanations on moon phases with an equal amount for better fishing under new and full moons. My clients and I have found great success under both moon phases. However my approach under different light conditions varies in many ways, I’ll explain. I’ve found that under brighter full moon periods muskies tend to stay away from the top-out areas of rocks, mid lake bars and reefs, I locate fish under these conditions on the edges or away from the structure rather than up on it as I do under darker nights. Muskies just seem to stay slightly further away from the surface when the moon is shining bright. Changing lure selection and/or presentations under full moon conditions may just be the key ingredient to a successful outing. Heli-Dawgs, Depth Raiders, larger heavier spinnerbaits like the Nut Buster and Cyco-spinner as well as willow bladed bucktails like the Llungen’s Reefer all of which get down deeper in the water column. I have found darker lures out fish the brighter ones under these conditions. Another remedy for these brighter nights is changing my location to weeds. I feel that weeds are your best target under the full moon phase whether spotty or thick. In fact at night I have some of my best luck in thin shallow weeds. Here my lure selection changes also, Double Cowgirls, Chatterbaits, Shumway Flashers, DC10’s and Pacemakers become my go to baits. Different than my daytime presentation I have found that a slower presentation has worked best during bright nights. Under the periods of low or no light conditions around the new moon my concentration goes back to those top-out areas on rocks reefs and bars, I look for the shallowest areas of the structure and stay on them. Here I like lures with a lot of vibration and noise, muskie located anywhere on the structure can easily locate these abhorring baits. Again Double Cowgirls and DC10’s are my first choice but my clients and I have taken a great amount of fish on Shumway Flashers, Low Ryders, Pacemakers and recently even bigger profiles from Musky Mayhem’s Super Model and Shumway’s Giant Flasher. This is especially true when working rocks, main lake bars and sunken islands. I’ve learned to position my boat so our casts extend well into the top-out areas that we are concentrating on. Here boat location awareness is crucial on nights with breeze; in your excitement after boating a fish this near shallow structure it’s easy to find yourself blown up to close. One of the first things I do after netting a fish is to get on the trolling motor and head out on nights with any wind at all, I don’t want to beat up my boat or spoke any other fish that may be holding in that area. Which brings to the location topic again, I have found that fish seem to hold tighter together on certain spots under low light situations. Landing multiple fish from the same small area after dark is not uncommon. How many times has this presentation been pounded in our minds in our muskie readings? That enticing boatside maneuver as we all know just might be one of your most important procedures in musky fishing anytime day or night but after dark the necessity of a precise boat side presentation magnifies significantly. Blind figure eights are the toughest for most guys I share the boat with. Too many of them only do their best figure eights when they see a fish following, at night most always you don’t have that advantage of sight. 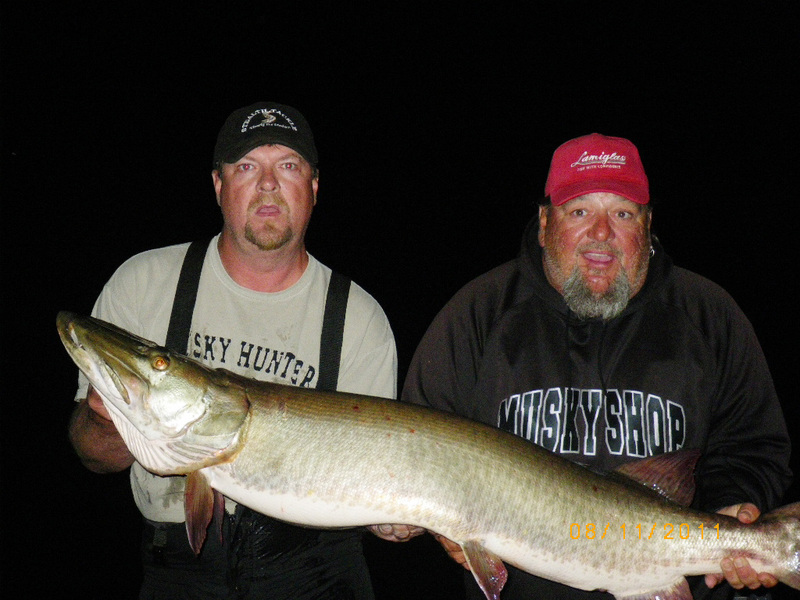 During my 2007 season my three personal best muskies all over 52 inches came at night right at the boat with no warning, also a good number of our largest missed fish at night were at boatside. So consistent proficient figure eights should be a natural part of your retrieve every cast to maximize your production after dark, here’s a few tips that has increased my clients production. A big problem I see is timing, when to start into that blind figure eight? For most guys that night fish on a regular bases its all about feel, however it takes a lot of nights on the water to get the touch. A few solutions to choose from are simple, one is the knot method. Either try what pan fisherman might call a bobber stopper knot. Simply tie a small knot to your line 5 to 6 feet above your leader or tie a 5 to 6 foot fluorocarbon leader directly to your line with a blood knot. Both will allow the knots to alert you as it crosses through the top eyelet of your rod. A more modern day solution is glow beads attached to either the leader or in the bait itself like the night bite by Llungentail; a good charged bead can be easily seen as it approaches the boat. Your first turn at the boat might just be the most imperative in enticing a boatside strike. Some equipment tips for night fishing include the most important which is lighting. First off is your headgear, although there are many different models out there a few just out perform others. Cats Eyes are a great choice; these head lamps clip to the bill of your hat and of course move as your head does. However my favorite are the many models offered by Petzi are the Cadillac of headlamps, a little costly but offer several settings including, colored bulbs combined with LCD bulbs which allows an extremely long battery and unit life. A more economical chose are those from Musky Armor. Also I like to keep 2 other types of lighting readily available to my clients and I while fishing under the darkness of the night hours. A high powered spot light for navigation, boat landing and handling non cooperating muskie in my Frabill net. When you choose a spot light consider those with a few options, AC & DC charging, wireless and most of all bright, a minimum of two million candle watts are very affordable these days. In addition in my boat I have a couple of good flashlights with extra batteries. Another important item is charged boat batteries anchor lights and other boat accessories, don’t forget your trolling motor too, some nights can get windy so be sure to have a full charge on your most important tool. Night fishing may just be your most effective method used to catch big muskies during the periods from early summer to late fall. Safety is a very essential part of night fishing. Boat organization, accurate casting and location awareness are all important to having an enjoyable and successful experience. Like all other techniques we use while chasing muskies after dark demands patience, determination and most of all time on the water.